Fred Noble remembers how he would end his ski days in the 1960s and ’70s. And he brought along friends just about every time — hundreds of friends over the years. 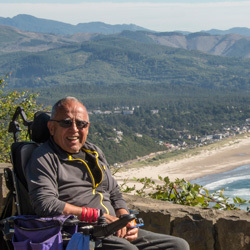 Noble is using his myriad connections to plan one last bash, Ski to Defeat ALS, a fundraiser for the Oregon and southwest Washington chapter of the ALS Association. He plans to raise $100,000. “No sweat,” he says. At 74 years of age, Noble doesn’t expect to be an exception. “Life for me has been one big adventure,” Noble said. “Now I find myself bedridden or in a wheelchair. In reality, ALS is pretty grim, but I don’t want people to feel sadness or pity for me. 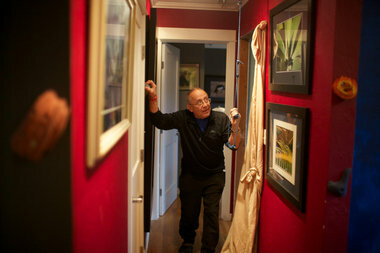 “It was the kind of thing where I hoped they would find a curable brain tumor or diagnose Lyme disease,” he said. “That sometimes mimics ALS. Noble’s most enduring legacy, besides introducing so many to adventure sports, is his work with the Columbia Gorge Windsurfing Association. “Back when Fred started windsurfing, he and his buddies started poaching a place we now call Rowena,” said Patrick Quigley of Hood River, a longtime association member. In the early ’80s, the undeveloped state park had a dangerous railroad crossing. So rather than cutting through barbed wire, Noble asked around to see whether he could improve the situation. It became the first of many windsurfing projects he spearheaded, tapping into the sailing community’s many private resources and willing volunteers. Skiing has always been Noble’s biggest love. He was hooked as a teenager at Franklin High School in the 1950s, when he started on one of two rope tows at Summit Ski Area in Government Camp. He remembers toiling on the beginner tow, envious of those riding the other tow and considering them “pros.” That just made him want to become a pro. Within a few years, he was launching off cliffs in three of Warren Miller’s annual ski movies. He became and remains the North American sales agent for Canadian Mountain Holidays, the world’s leading helicopter ski operation with backcountry ski terrain in British Columbia larger than Switzerland. “I won some silly award for ski photography that was presented at the 1980 Warren Miller movie,” Sanford said. “Fred was the movie’s MC for many of those years, and we became friends. Recently, they joined him for a day of skiing at Mt. Hood Meadows, where Noble used a device called a sit ski. It allows those who can’t control their legs to glide down a run in a chair mounted to twin skis, using outriggers attached to the arms to maintain balance. To avoid losing his season’s pass, Noble outskied the head of the patrol, dashed into the lodge, ordered a pitcher of beer and took off his boots. That gave him plausible deniability of being in the woods, once the patrol chief caught up. That was just another day on the slopes with the Fredinator, his nickname that will be used in a book on Noble’s life being written by Phil Favorite and a documentary under production by Andrea Johnson.